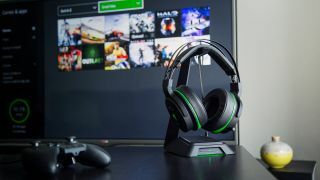 Razer has announced a new Thresher Ultimate wireless gaming headset for the Xbox One and PS4 – also compatible with Xbox One X – that promises to bring Dolby 7.1 surround sound. By all appearances, Razer’s latest headset looks like it shares a very similar design to its other sets of cans, namely the ManO’War and Kraken 7.1 V2. Not that we’re complaining – it’s a proven design and should be just as comfy with large, noise-isolating leatherette ear cushions. Razer also plans to offer cooling gel-infused ear cushions for extended play sessions. One major new element the Thresher Ultimate brings is a wireless base that users can plug directly into their consoles. Razer claims the headset should stay connected up to 40 feet away. Battery life, meanwhile, is rated at 16 hours while recharging them fully should take four hours. The Razer Blade Thresher for both the Xbox One and PS4 are available for pre-order now and are priced at $249 (about £200, AU$330).